Some independent journalists in China call themselves grassroots historians and publish their writing on social media platforms. 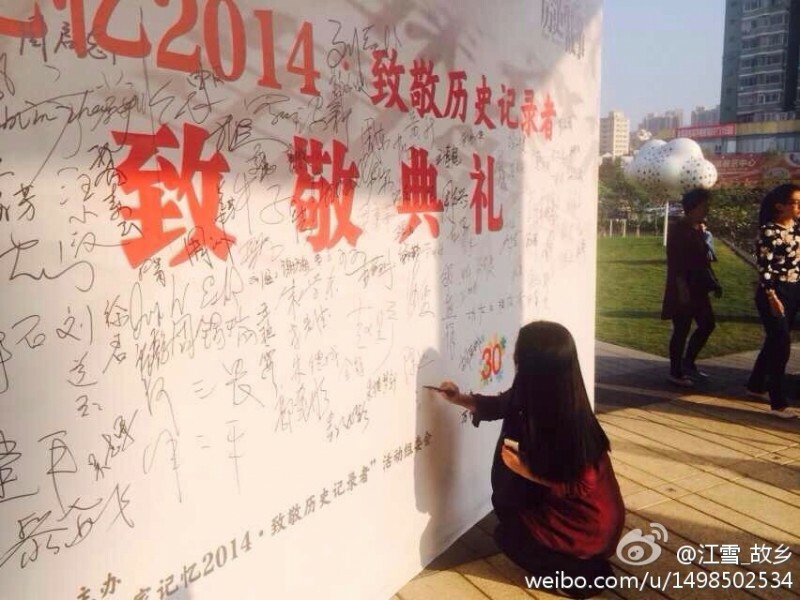 They also participate in historical gatherings such as the Shenzhen History Carnival in 2014, seen here. Photo from Jiang Xue's Weibo. This article was written by Ip Iam Chong and originally published in Chinese on citizen media platform inmediahk.net on May 6 2016. The edited version below was translated by Kristen Chan and is published on Global Voices as part of a content-sharing agreement. An experienced Chinese journalist recently told me that nearly all major news stories that captured public attention in the past three years were written by independent journalists who have no legal status in China. As propaganda authorities have become increasingly unreasonable and numerous journalists have received jail time for doing journalistic work, more and more professional journalists have either abandoned or transformed their careers. While some have moved into management positions at major online news portals, others have left media outlets and started writing and distributing independent investigative reports by making use of social media. Media outlets in mainland China are all state-affiliated, falling under the control of provincial governments, party committees or propaganda departments at different administrative levels. There are no privately operated media outlets. For instance, the Southern Media Group, which has operated a number of outstanding newspapers including Nanfang Daily, Southern Weekend and Southern Metropolis Daily for liberal voices, is under the supervision of the Guangdong Province party committee. Officials from the propaganda department can step in and take control over a newspaper's editorial at any time. Although the people in the latter group are journalists by training and by trade, they are do not fit China's legal framework for what constitutes a journalist. Indeed, it is illegal for a person to identify as a journalist if he or she does not hold a press card. All journalists must hold a press identity card issued by registered media outlets, otherwise it is illegal for them to call themselves journalists. The press card must be renewed annually by the journalist's work unit or it will expire. At a recent conference, I met a number of independent journalists from mainland China. They identified themselves using terms like “writer”, “grassroots historian”, “interviewer” and other monikers avoid using the term “journalist” to describe their work. One type among this group is similar to those independent journalists working in Hong Kong. They choose and research topics according to their own liking. Rather than pursuing “hot topics”, they typically follow the convention of reportage literature, by researching historical events such as grassroots stories from the anti-Rightist Campaign and Cultural Revolution, or the history and culture of a particular place that has been neglected by the general public. Apart from reports, they also write commentaries. They commonly distribute their writings through WeChat's public pages. The social media platform offers an option similar to Facebook's public page where other users can subscribe to the content on a particular page and interact with the writer/administrator. WeChat even has a “reward system” that encourages readers to pay a small contribution to the writer. For example, Jiang Xue, a journalist with 20 years of experience in the field, has rebuilt her career as an independent interviewer by using WeChat public platform last year. Most of her interviewees are from grassroots groups. Another common path for independent journalists in China is to work as an informal media outlet sub-contractor. These journalists have close connections with editors or management staff from more established media outlets that cannot initiate their own investigative reports because of internal censorship. However, they do have budgets to buy content like individual interviews, photos and features from outside writers and pay famous bloggers to use their platforms. Hence this group of independent journalists can make a living by selling their reports to conventional media outlets or portal sites. According to existing regulations, portal sites cannot conduct original news reports and hence cannot have their own reporter teams. Yet, they have paid columns or paid special features for independent writers to fill in the content. For example, reports from the WeChat public platform “Qianjieyihao” or “No.1 on front street” are frequently quoted by news portals such as Ifeng, QQ and even Xinhua. The platform, which describes itself as “the Eden of a group of oppressed social reporters,” publishes posts produced by teams, some of whom may be affiliated with state media. There are no reliable figures on how many journalists work in this mode in China, but it is clear that they are walking on a tightrope which carries immense risk, but can also yield opportunities. Independent journalists have no institutional protection. The censorship system within media outlets is a form of control, but it also protects journalists from touching sensitive issues that can get them into trouble. The bureaucratic structure makes certain that responsibility is shared at all levels — editors and management staff work to ensure that news coverage will not break local laws or offend state or party officials. This minimizes the part that the journalists have to take on their shoulders. Outside the umbrella of the media institution, independent journalists face many more risks. After the introduction of China's Rumor and Libel Regulation in September 2013 , which criminalized rumors and defamatory content that has been reposted 500 times or more, reporting on sensitive stories became much more dangerous for them. The growth of the independent journalism sector depends on individual courage, but it has also benefited from developing media and communication ecologies. More and more, breaking news circulates first via social media. Similar to other parts of the world, the conventional media sector is withering in the face of competition from online media — this may be even more pronounced in China, where censorship practices have made state-affiliated media increasingly rigid in recent years. And in contrast to conventional media outlets, where sensitive content often never makes it to the printed page, sensitive online content is deleted after publication. A popular post that touches on sensitive topics can reach tens or even hundreds of thousands of readers within a few hours on WeChat before the web censor steps in. In the face of rapid growth of capital investment in the Internet and technology sector in China, content is king and news content is also essential to the development of online platforms. As independent journalists are more flexible and courageous in picking up social topics, including sensitive ones, they are welcomed by Internet portals. Thus their work is high-risk — and in high demand.